I felt like we instantly can bond with our characters – because who doesn’t love a good bunch of rejects? I feel like we’re programmed to find them quirky and adorkable. Because this group is totally all of this. I want to wrap them all up in my arms and snuggle them because they are so precious. At the same time, they don’t really need protection, because the whole book is about them defying society’s expectations of them to be just general bad asses. At the same time, there is such diversity (hijabi wearing side character, trans side character, bisexual protagonist, gay side character, and more). It’s built seamlessly into the world from the very first pages. I realize I point it out a lot, as if it’s not the norm (although in my reading taste it is), but the thing is that it needs to be said. It needs to give the book added love, to give the book’s readers the knowledge, and the possibility for you to identify with one of their journeys – except not in space. when we feel on the fringe and excluded from the fabric of society. 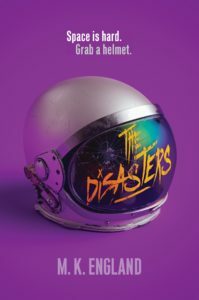 The Disasters is a book about finding a crew, creating a family, and reconnecting. It’s not only about friendship, but it’s also about realizing that sometimes only you can do the work and the universe needs you. This book made me happy from start to finish – first because I couldn’t resist the charm and attitude of the main character, and then at the end as they begin to band together and form their found family. Find The Disasters on Goodreads, Amazon, Indiebound, & The Book Depository. I’m in love with that cover, what’s your favorite cover? I read an ARC of this too and loved it. The characters are fun. I loved the banter. I loved the action and setting. Five stars from me on Goodreads. This book has everything I want to find in the books I read. Yes! I felt the same !